Jackson Lake is one of the best outdoor recreation areas to visit during the summer months. 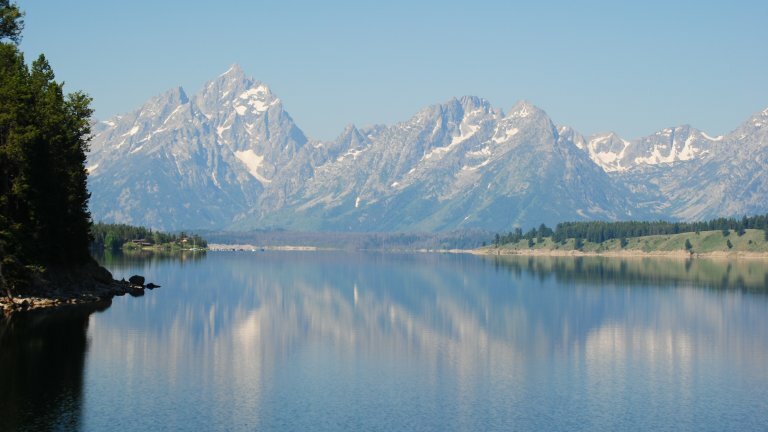 Cool off on the lake and take in sweeping views of Grand Teton National Park. In the northwest region of Grand Teton National Park lies Jackson Lake. This 15-mile long glacial lake is located at the base of the Tetons. While it is a natural lake, its size increased significantly with the construction of a damn in the early 1900s. It has since become a recreational destination, with visitors flocking to Jackson Lake's shores for fishing, boating and camping. Boat rentals are available at Signal Mountain Lodge, which is located at the southern end of the lake. Spend a day water skiing, wakeboarding, or exploring the many islands and inlets. There are more than 15 islands in the lake, and the largest one is called Elk Island. For a unique camping experience, spend a night at the primitive site on Elk Island. You can reserve this spot at the visitor centers in Moose, Jenny Lake or Colter Bay, but plan ahead, as this is a popular camping destination for locals and visitors alike. More developed campgrounds are also available at Signal Mountain, Colter Bay, and Lizard Creek. Fishing enthusiasts will enjoy the healthy trout population, which includes lake, brown, brook, and Cutthroat, as well as salmon and pike.Stop by the Craig Thomas Discovery & Visitor Center to inquire about fishing regulations. And for those looking to catch up on some summer reading or work on a tan, the many bays and shores on Jackson Lake provide the perfect setting for a "beach" day. You might even forget you are in landlocked Wyoming, as you gaze out over the water...although the towering mountain peaks might give it away! Looking for more things to do in Jackson Hole? Check out all our recommendations for summer fun or give us a call at 888-838-6606 to set up a guided tour or activity in Grand Teton National Park.